What Are the Health Benefits of Dried Cranberries? Cranberries are a red, tart berry that can be blended into smoothies, made into juices or turned into baked goods. They're one of the most popular berries in the United States and are commonly consumed over the Thanksgiving and Christmas holidays. While you won't often eat fresh cranberries on their own, they're a popular snack once dried. Like other dried fruits, cranberries are a good source of fiber and antioxidants. Dried cranberries are literally just cranberries that have had their water content removed. In general, one cup of fresh fruit becomes a quarter cup of dried fruit. This means that a quarter cup is a serving size for dried fruit, like cranberries. Drying cranberries can involve a variety of different processes, including sun drying, hot-air drying, freeze drying, vacuum drying and a variety of other more high-tech drying techniques. Each method results in the retention of different amounts of nutrients in the cranberries. In general, air-drying methods allow for fewer nutrients to be retained in your dried fruits. Like other dried fruits, dried cranberries are known for being a good source of fiber. Each quarter-cup sized serving (40 grams) has 8 percent of the daily value for fiber, in addition to 6 percent of the recommended daily value for vitamin E. They also contain a variety of other nutritive compounds, from essential amino acids to nutrients like lutein and zeaxanthin. Dried cranberries have small amounts (between 1 and 4 percent) of several vitamins as well, including vitamin A, B-complex vitamins and vitamin K. In addition, they contain small amounts of minerals like copper, iron and manganese. The ideal dried fruit has no added ingredients with no sugars or preservatives. It's just dehydrated fruit. While this is often the case for naturally sweet dried fruits, like raisins, it's not the case for cranberries. Almost all dried cranberries have added sugar since they're naturally a very tart fruit. A popular type of dried cranberries you may be familiar with is called Craisins. It's a product well known for its added sugar. One cup of fresh cranberries supplies about 9 percent of your daily value of sugar. In contrast, dried cranberries with sugar added often contain very large amounts, as much as 58 percent. Without the added sugar, the total sugar content in dried cranberries would be more comparable to a cup of fresh cranberries. If you're worried about the sugar content in cranberries but prefer to consume them in their dried form, you can dry them at home. This way, you can avoid sugar altogether or use healthy alternative sweeteners, like stevia or xylitol. Dried fruits are often thought of as condensed fruits. All the beneficial vitamins, minerals and other properties are in a preserved, snackable form. Unfortunately, this isn't always the case. Since different ways of making dried cranberries can influence their nutrition, one cup of fresh cranberries doesn't have the same nutrients as the equivalent quarter-cup serving of dried cranberries. In general, fresh cranberries have more vitamins and minerals: There is 12 percent of the daily value for manganese in fresh cranberries, for instance, and 16 percent of the daily value for vitamin C. There's also 6 percent of the daily value for vitamin B5 and 9 percent of the daily value for vitamin E. Although dried fruits are known for being good sources of fiber, there's even more fiber (14 percent of the daily value) in a cup of whole, fresh cranberries compared to the 8 percent found in dried cranberries. Despite these differences in vitamins and minerals, other beneficial aspects of cranberries don't change during the drying process. The antioxidants and other bioactive compounds found in cranberries are well-retained. These compounds are associated with the majority of the benefits found in these berries. Cranberries are far better known for their bioactive compounds than their nutrients. These compounds are linked to a variety of health benefits and can provide protection against degenerative and chronic diseases. The compounds in these berries are good for your cardiovascular health, metabolism and immune system. Cranberries are also known for being able to help maintain the health of the urinary tract. Cranberries have a variety of diverse bioactive compounds, most of which are considered antioxidants. These include bioactive compounds like quinic, malic and citric acids. Citric acid is the most commonly found organic acid in these berries. You'll likely be familiar with citric acid because it can be found in citrus fruits, as its name implies. This antioxidant is part of the reason cranberries have such a tart flavor. Cranberries are also rich in other antioxidants, like flavonoids. These antioxidants are associated with reducing cholesterol and the formation of blood clots. They can also help prevent urinary tract infections, gum disease and stomach ulcers. Cranberries contain proanthocyanidins, which are polyphenols and also part of the flavonoid family. These particular antioxidants are important as they have cardioprotective, anti-cancer and anti-inflammatory properties. Cranberry proanthocyanidins also have antimicrobial properties. These can, along with the other beneficial compounds found in these berries, help make sure that your digestive system is colonized with only good bacteria, rather than disease-causing ones. There aren't too many downsides to eating dried cranberries, as long as you consume them in moderation. However, if you regularly consume dried fruits, you should be aware that these products have been tied to microbial contamination. After harvest, fruits often carry microbes that can produce toxins. Although these disease-causing bacteria and fungi typically die during the drying process, some of them can remain and cause health problems. 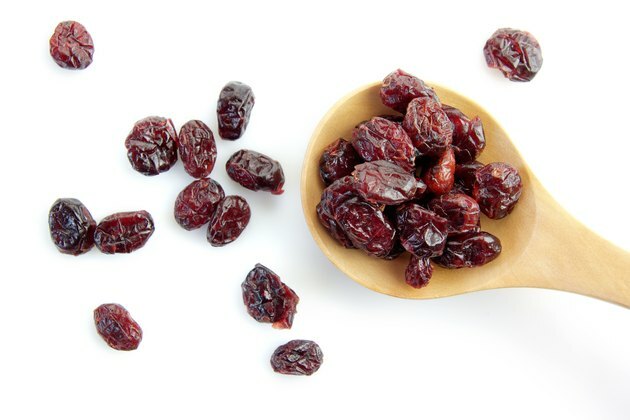 Such pathogens are known to occur in dried fruits like raisins, sultanas and currants. Fortunately, they are infrequently found in cranberries compared to other dried fruits. The Globe and Mail: Is Dried Fruit Good or Bad for Me?